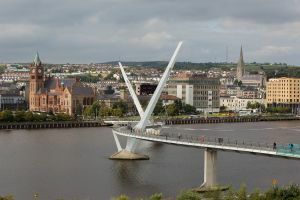 Just a year later, the dramatic Peace Bridge spanning the River Foyle was opened by Peter Robinson, first minister of Northern Ireland at the time, the late Martin McGuinness and the then Irish taoiseach Enda Kenny. While totally within Northern Ireland, the cycle and foot bridge is very symbolic of a bright future for the city. The border to Ireland is less than five miles from St Eugene’s Cathedral, in the very centre of the city. No border controls as this piece is written. The award was a tremendous achievement for a borough that over a 400-year period has had more than a few ups and downs, culminating in what became known as ‘Bloody Sunday’, the Bogside Massacre, on Sunday 30 July 1972 when 14 people died. Harold Wilson was prime minister. From those terrible times, action by people with goodwill and tenacity has demonstrated that with effort and understanding there is always hope. Today, Derry, a World Heritage Site, is a tidy well-to-do town and popular centre for tourism. “The Troubles” are not forgotten or hidden and are a constant reminder that for prosperity people must work together. BTN recommends the city not just for a day out, as in our case, but a longer stay. There are many local attractions and Donegal, across the border, is not far away. (See BTN 14 August 2014) Loganair’s new twice daily air service from Stansted can only help bolster the numbers. (See BTN 25 February) The city’s welcoming airport is just a 15min taxi ride away on a quiet dual carriageway, the alternatives a slow but picturesque 2hr rail journey from Belfast (or by car) and by road from Dublin, 150 miles away in the Republic. Derry is the only completely walled city in the British Isles. The name Derry itself has nothing to with sectarianism, created well before ‘The Troubles’. It is a derivative of the old Gaelic word Daire, meaning “oak grove”, a tree that dominates the local hillside and which, together with the deep River Foyle, helped to establish Derry as a shipbuilding centre. London was added as a kind of thank-you to the City Guilds of London, which paid for the building of the walls in the period 1613-1618. At that time, all cities were fortified and for good commercial reasons an investment in what was already a recognised port seemed a sensible idea. It suited King James I too as he established himself as the English (and Scottish) Protestant King. The walk around the walls is just over one mile and can take as little as 20min but it is best to join a recommended trip and allow for up to two hours. 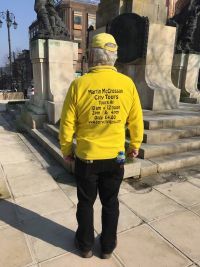 BTN’s guide, John McNulty of Martin McCrossan City Tours, was a fascinating raconteur very knowledgeable and just about understandable in his local brogue. Very good value for £4. The Walls of Derry gained instant fame in 1688 with the longest siege in British history. The Protestant garrison was about to surrender to the Jacobites but were reinforced by a motley crew of apprentice boys who disagreed vehemently, and with a resounding cry of "No Surrender!" took charge of the already opened gates, slamming them shut. The deprivations of those inside became folklore and half of the 8,000 mainly civil population were said to have died. King James II, the only British Catholic monarch (1685-1688) appeared at the gates after his brief reign and went on to be defeated at the Battle of the Boyne. 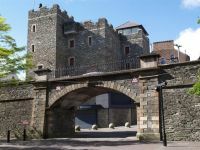 The Siege of Derry is part of Northern Ireland Protestant folklore and is commemorated by two parades: the Shutting-of-the-Gates Parade and the Relief-of-Derry Parade. Derry was relieved by a small fleet of three navy ships on 1 August 1689 after 105 days. The walk includes all four gates to the city and a view and briefing on the Bogside, still very much a Catholic area but now offering its own tours and an educational insight into an Irish version of civil rights. And being Ireland you can finish up at the Bogside Inn close by the remarkable and poignant Bogside Murals, a kind of Banksie open-air art gallery. After the Walls walk a lunch was required and provided by the Shipquay Boutique Hotel, a popular haunt. One thing for sure, in Derry you will eat and drink well. Next stop the remarkable Guildhall, said to be modelled on the more famous one in London. 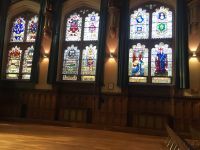 The series of stained glass windows are utterly remarkable recounting the history of the city from earliest times to the very recent past, a snapshot of Irish and British history in the early 20th century. They celebrate a heroic imperial age typified by the Girdlers Window, which contains the maple leaf for Canada, the lotus for India and the floral emblems of Ireland, England, Scotland and Wales, and the Red Hand of Ulster. Other windows commemorate the achievements of the three Irish divisions in the British Army, with representations of their cap badges and regimental colours. Located within the City Wall is the Tower Museum which tells the colourful story of Derry from earliest prehistory time to the present. In the theatre there is a continuously running short video. The most westerly allied port in Europe, Derry was a key communications base during the Battle of the Atlantic and the official surrender point for the German U-Boat fleet in May 1945, all 63 of them. They were later all scuttled and none remain. Today the former US Marine base ‘Beech Hill’ is restored as an elegant country house hotel where you can still enjoy a themed tea dance in the style of the 1940s. The old barracks are being renovated with a careful eye on history, soon to become homes. When it comes to hotels there are a small number of 3- and 4-star properties in the city and some glorious countryside properties on both sides of the border within easy reach. They will be supplemented shortly with the opening of the Holiday Inn Express with 119 rooms making it the second largest hotel in the city and opposite the Quayside Shopping Centre complex, very much a central point in the town. Due to open next year is the reconstructed Waterside railway station which even today, using a temporary site, offers an hourly, and leisurely, ride to Belfast in just over two hours. Britain’s first “City of Culture” makes a fine base for a Northern Ireland and Donegal holiday.